Every January, the Pope greets a corps of 178 Ambassadors inside the Vatican. They all hail the Pontiff. Who is like the Pope? Representatives of all kind of religious nations hail him, inside his kingdom established as a statehood. The Vatican Statehood is unique. The Pope is the only religious leader who has been gifted immunity from prosecution. He can not be put for trial outside of the Vatican, as long as he do not commit war crimes. The Pope is above the law, and is not touchable. Still he is worshiped by leaders who represent all nations and religions, dictatorships and democracies alike. The pontiff fits perfectly into this Bible verse. All inhabitants of the earth will worship the beast—all whose names have not been written in the Lamb’s book of life, the Lamb who was slain from the creation of the world. It is amazing that the US and Iran both have representatives hailing the Pope, even though they can not sit eye to eye in the United Nations. 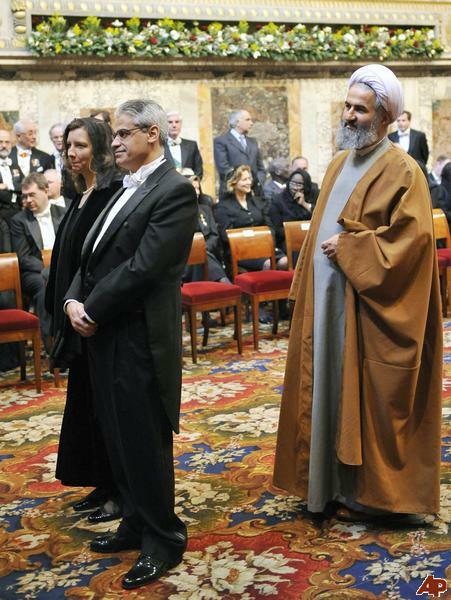 The US Ambassador and the Iranian Ambassador at the same Vatican party. 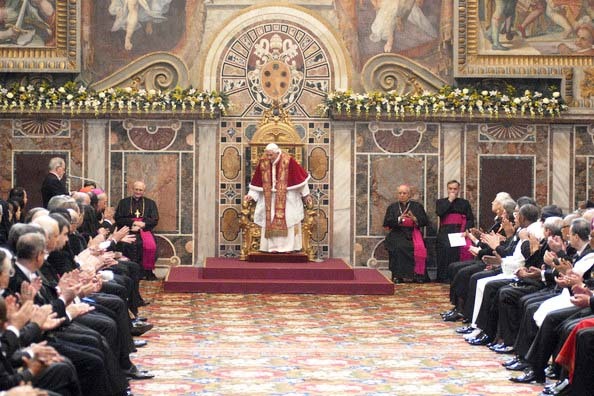 Benedicts is hailed by diplomats from all nations as he takes rest at his claimed “holy chair”, elevated above them all. Pope Francis leaves a meeting with ambassadors to the Holy See at the Vatican Jan. 13 2014. 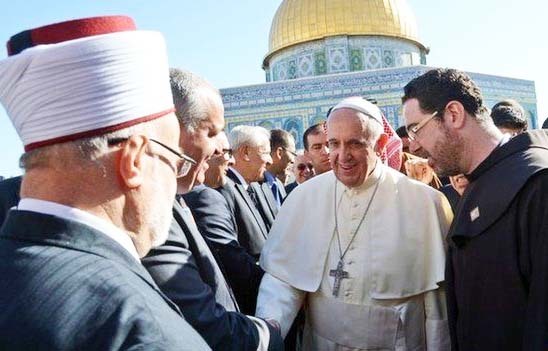 Will the Pope be able to bring them into a final “peace agreement”? 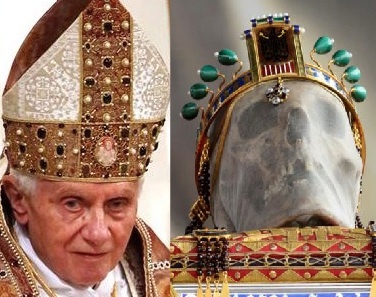 The beast in the Vatican, came to power by another beast. From 1929, they were riding together. 1929 was the year, fascist leader Benito Mussolini gifted the Pope a statehood inside the capital of Italy. 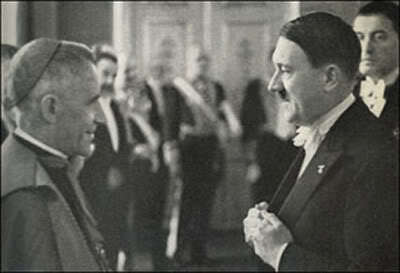 Nazi Germany had warm diplomatic relations with the Vatican. The Popes ambassador in Berlin, Nuncio Orsenigo celebrated Hitlers birthday in 1939. For God has put it into their hearts to accomplish his purpose by agreeing to hand over to the beast their royal authority, until God’s words are fulfilled. 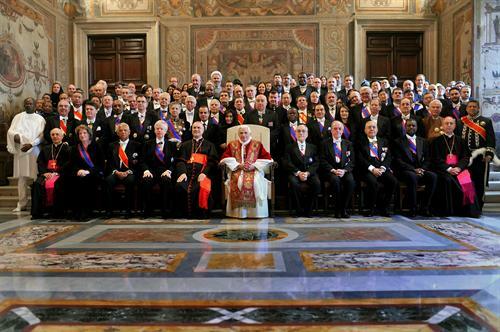 The Pope in front of the diplomatic corps in the Vatican. 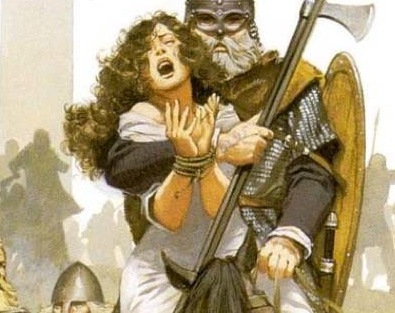 It is worth understanding that “Catholic Mary” in the book of Revelation, is used as a name of the city of Rome, the city that rules over the Kings of the Earth. 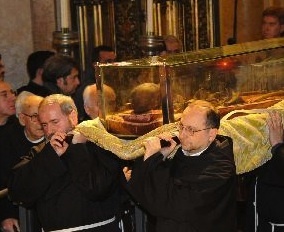 The Pope has gifted his life to this copy cat of the Mother of Jesus. 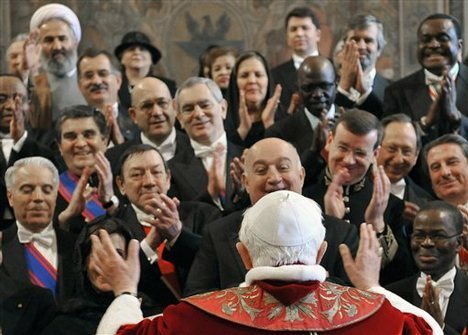 Every January, the pope delivers his annual “state of the world” address to the diplomatic corps at the Vatican. January 8, 2009. 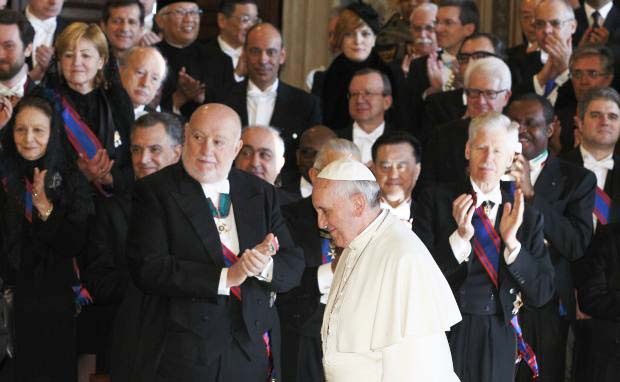 Diplomats of all colors are gathered to hail the Pope. This year He’s expected to underline his concern over recent acts of violence and discrimination against Christian minorities around the world, which was a main theme of the World Peace Day message this year. Lets take a look at what one blogger wrote about the Popes address January 11th 2010. Earlier this morning, the Pope received the diplomatic corps accredited to the Holy See — now 178 in all, following last month’s establishment of full relations with Russia — for their annual New Year exchange of greetings. 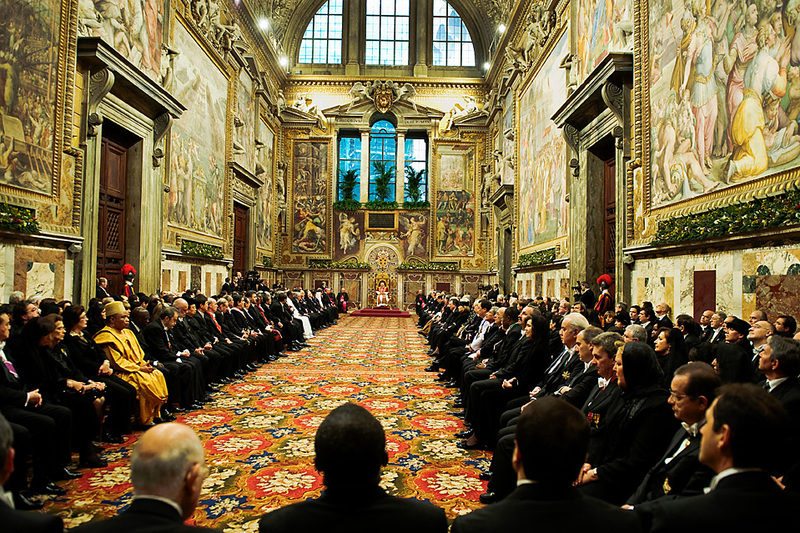 Source for information about the Diplomatic corps in the Vatican. 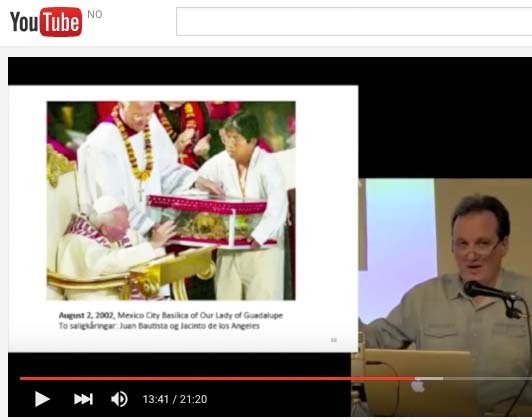 What is the Papal mission. 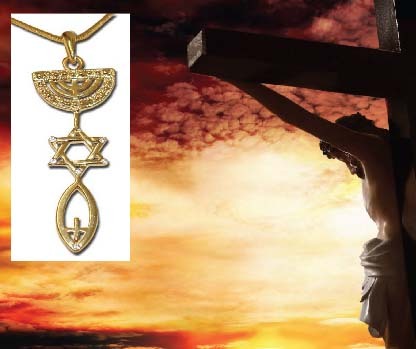 Do the Pope represent Jesus the Messiah on Earth? Muslims worship God, the Creator of Heaven and Earth, who has spoken to humanity. And as believers in the one God we know that human reason is itself God’s gift and that it soars to its highest plane when suffused with the light of God’s truth. 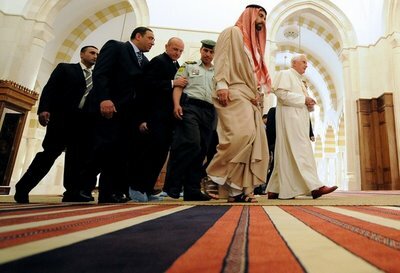 Source of Pope’s statement in Amman. The Pope deletes the name of Jesus, and do represent a different kingdom, than the Kingdom of the King of Kings in Heaven. The Vatican’s authority has come up from the abyss. The Pope is busy running around, building the One World Religion. Here in Amman in Jordan. 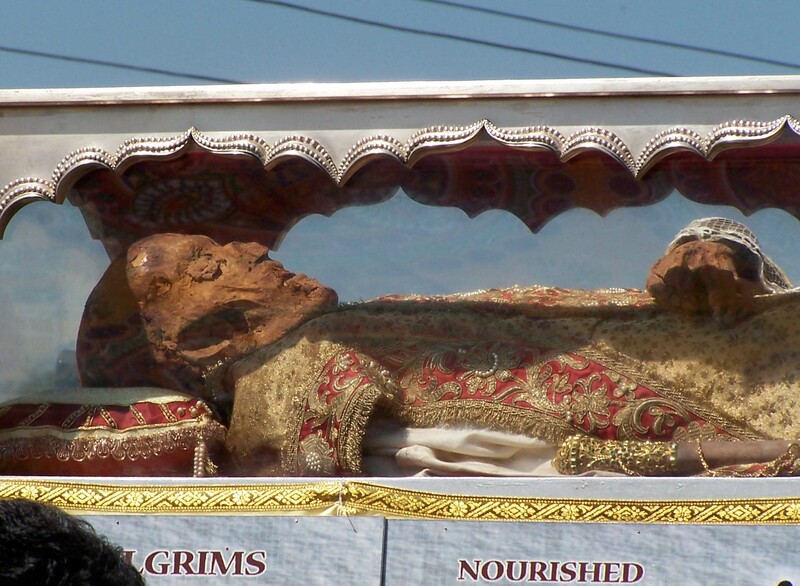 What will happen to the Roman Catholic Church, who is lead from Rome? The Vatican statehood will not stand in the day of judgment, like all other nations on Earth. The Papal statehood will be destroyed when Jesus returns. All the diplomats will be stripped of all their medals. Today there is luxury, and unlimited parties. But when the party-killer Jesus returns, they will all weep and mourn. [ Threefold Woe Over Babylon’s Fall ] “When the kings of the earth who committed adultery with her and shared her luxury see the smoke of her burning, they will weep and mourn over her. 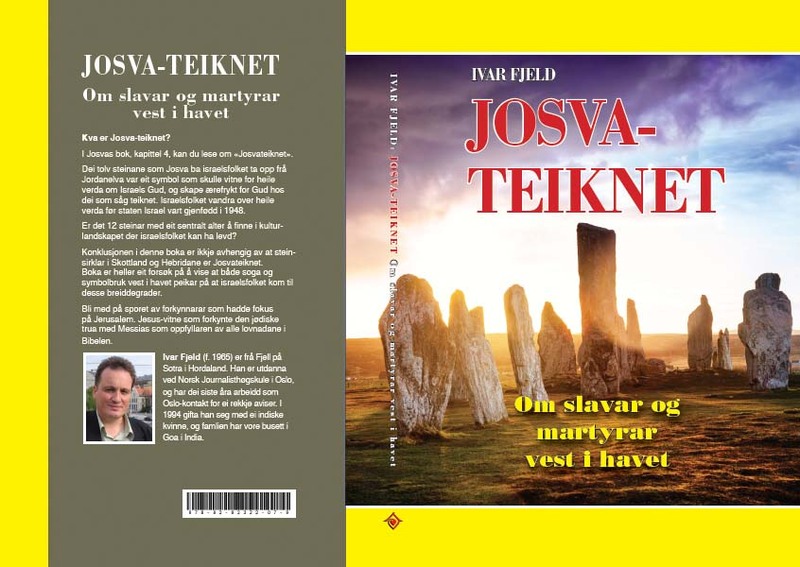 First published 8th of January, 2011. I don’t think Jesus or the Father are party killers. First of all he picked Noah and what did Noah do after the flood? He grew a vinyard and got drunk. Secondly, What is the punishment of all the nations who come against Jesus? Zechariah 14:16 Then the survivors from all the nations that have attacked Jerusalem will go up year after year to worship the King, the LORD Almighty, and to celebrate the Feast of Tabernacles. That Noah got drunk, became a curse for one is sons. It is horribly wrong to justify getting drunk. Do not get drunk on wine, which leads to debauchery. Instead, be filled with the Spirit. For you have spent enough time in the past doing what pagans choose to do—living in debauchery, lust, drunkenness, orgies, carousing and detestable idolatry. I know that you like to disagree. But this message should have been easy to understand and supported. I stated that Jesus is a “party killer”. Not a joy-killer, or a killer of celebrations. The diplomatic parties and the rave culture within the global elite, are like pits of sin, selfishness and over consumption. True followers of Jesus are suppose to surrender their life in flesh, and live simplistic life’s. You would make a good liberal progressive, blaming Noah for his sons mischief. You miss my point, the irony of it. You say he is a party killer but the punishment for all who oppose him is to have a party. You make him out to be a prude or something. He did turn water into wine you know. THINK OF THE HORRIFYING CONSEQUENCES! – If it is not… Then billions of people have been deceived. 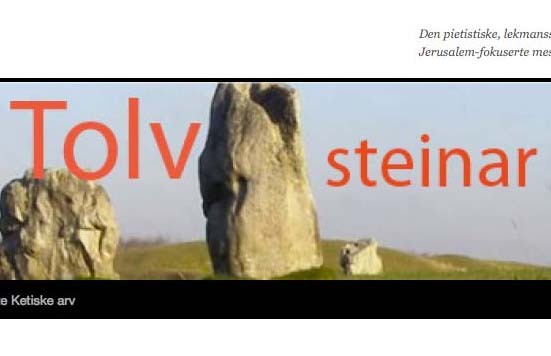 – If it is not… Then the Ecumenical Movement is not of God. Movement is not of God. The Bible are full of hope, but also tragedies. The first started with a rebellion in Heaven, when 30 per cent of the angles were judged and kicked out. The tragedy seems to be not revocable. Someone had to be Judas, and someone has to be the final beast. And someone has to be among the billions of people who will have to spend eternity in Hell. We all got a chance to read the Bible, and be set free from the consequences of past and future tragedies on planet Earth. But people delight in darkness…. For he has rescued us from the dominion of darkness and brought us into the kingdom of the Son he loves. It does seem a shocking thought that the Roman Catholic “church” is not really a church but sadly when men mix the Word of God with creeds and dogmas they are not Christian anymore. Jesus said to the churches of his day in Matthew 15:9 But in vain they do worship me, teaching for doctrines the commandments of men. It is just like when Satan tempted Eve in the garden of Eden. Did Satan tell he there is no God? No, all he did was change the Word the God had given them to live by just a little bit and it brought death in. So it is today. Adding to and taking away doesn’t literally mean cutting pages out of the Bible but it means putting your own interpretation on it as well. You are right. The Roman Catholic Church has placed it self above the Word of God, and the Pope has been elevated to the place of God, hailed as “The Holy Father”. The Catholic religion is the worst nut to crack for Evangelical Christians, and a dangerous trap. Because within the teaching chaos of Rome, there is a copy of “Jesus”. If it is not in the Bible,then it is unbibical. How ironic they also hold to a belief not taught, let alone mentioned in the Bible? 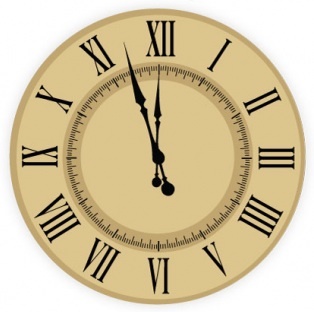 As ANY protestant to give you the date of the founding of his church. Not one will be able to legitimately provide a date earlier than the Middle Ages. But also did it ever occur to some of you (and I ask this as a general question – I am not trying to be inquistorial) why God would allow his people to “wander around” for 1500 years without any guidance as to what was and was not the true faith, but then suddenly he gave such guidance to people such as Calvin, Tynedale, Luther, et al., and that it all happened around the same time? Don’t protestants find that odd? And even if the above were true, what happened to the “one” protestant belief supposedly delivered to the men I mentioned, so that we now have thousands of independent protestant churches that continue to pop up because none of them can go to one teaching authority and be assured that one teaching is right? Leave out the religion if you want – logic, alone, tells me that it makes no sense for Christ to establish a visible church on earth and then provide no guidance as to getting his word out to the rest of the word. then at Antioch we started being called Christians. So in time Christians began to be also called Catholics. Especially as various heresies arose in the first centuries..
Of course we still call ourselves Christians…but also we used the term Catholic. Now a days we have many sorts of Christians –who are indeed Christians and our brothers..though we are unhappily not yet in full communion. 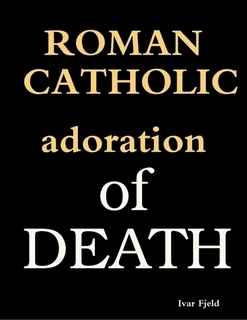 Catholics are Christians who in full communion with the successor of Peter. We call ourselves Christians all the time…Pope Benedict XVI when addressing the faithful does not usually say “Catholics this or that” but he calls them Christians…for that is what we are. Other Christians have various degrees of communion with us (not speaking here of Holy Communion ..but of “being in communion with”). Are Catholics Christians??? Yes most certainly! And with our fellow Christians…..let us seek to love and follow our Lord Jesus Christ! I if someone says their church was started during the Protestant reformation, then they would probably say that Knox or Luther, etc. started their church about that time. If you ask a me I would say my church, the body of Christ, was started long before that. It was built upon the apostles and prophets, Jesus Christ Himself, being the chief cornerstone. We were first called Christians in Antioch. We have nothing to do with popes or Constantine or masses, just as the early Christians had nothing to do with them. The Catholic church, one of the two great works of the devil, came about a few hundred years after us. Then the other great work of the devil, Islam, came a few hundred years after that. I don’t know why the term “reformer or Reformation” came to be used because the Catholic church can’t be reformed. It was brought about to lead people away from Christ and persecute the brothers and sisters. Islam is up front and in the open about being antichrist. Catholicism is a wolf in sheep’s clothing. You, Allen, as so many others are a victim of this wolf. If you ask the Lord, in sincerity, He will show you. So what’s the big deal if there are thousands of independent churches!!! I would rather be in a small church of believers who love the Lord Jesus Christ than in a global church where it is evident there is a lack of love in their actions. The reason the world likes the pope is because the pope is of the world and the world hears him. Definitely RCC has huge influence (power) over world governments. Simple fact that it is willing expect all world religions under its wings, is enough for me to see it’s NOT from God. People already tried unite in their endeavor to be like God. They failed. Consequence – people are divided with languages – caused by God on purpose. Today, RCC is trying to reverse that and do the same thing over again. They have very sophisticated system in place to achieve it. And most of humanity is going to fall for it. Pope’s naming the reasoning of men as some kind of motive for unity of world is so familiar to what Illuminati have as their main philosophy point. Not faith, but reason.